Anyway these Stoke beers are exclusive to Dan Murphys (I think). The family behind it are the McCashins, who have been credited with kickstarting the micro-brewery movement in New Zealand with their McCashin’s brewery in the 1980s. The original label for this brewery was Mac’s, a label that was in turn sold to Lion in 1999, with Lion eventually moving the brewing from Nelson to Wellington. That left the original McCashin’s brewery complex empty. 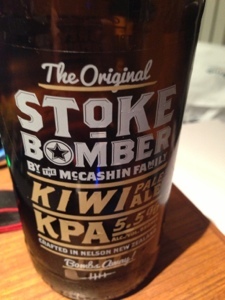 until parts of the McCashin family reinvigorated it back in 2009 and hence launched the Stoke label. What makes this a This Kiwi Pale Ale is the Wai-iti hops, grown only in New Zealand. It’s a light and generous sort of number without the overt hoppiness of the American Pale Ale style, the palate more caramel and generous than bitter and the finish soft and gentle. Net result is sessionable beer if perhaps a little non-descript and lightly diffuse for big love. Drinkable if not quite remarkable. Would I buy it again? Drinkable but not interesting enough to buy a case. The aroma was yeasty/toasty (biscuits, they said on the back label) with delectable citrusy background on both nose and palate. I liked the soft, almost creamy carbonation which reminded me a lot of the genuine French Kronenbourg 1664. Good to see some respectful disagreement!